Newspaperman, co-founder of the Socialist Party, and first Socialist U.S. 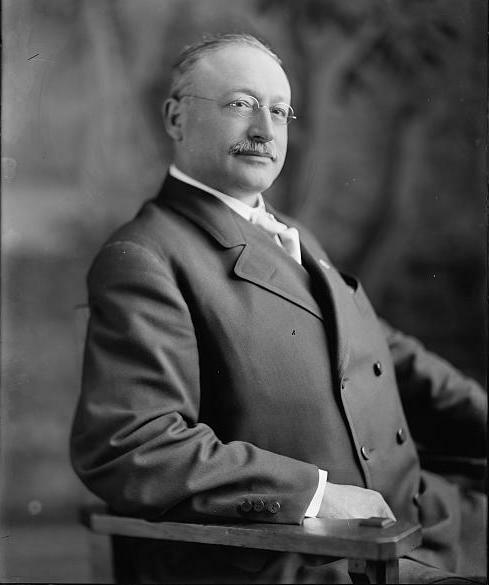 Congressman, Victor L. Berger (1860-1929) created the party apparatus that shaped Milwaukee politics for a half century. Berger fought for free speech, opposed war, and advocated for programs ranging from old-age pensions to Milwaukee’s public parks. Berger believed that change would come through evolution and democracy, and not through revolution. Born to a Jewish family in Austria-Hungary in 1860, the young Berger moved with his parents to Bridgeport, Connecticut in 1878. Three years later, Victor settled in Milwaukee, where he found employment teaching German in the public schools. Berger soon embraced socialism and became involved in labor politics. In 1892, Berger purchased a German-language newspaper which he renamed Wisconsin Vorwärts (Forward). He expanded his publishing operations by founding the English-language weekly, Social Democratic Herald, in 1901 and the daily Milwaukee Leader in 1911. In 1898, Berger and Eugene Debs founded the Social Democratic Party which in 1901 became the Socialist Party of America. Active in creating a strong local party, Berger’s success was due to well-planned local organizing and to alliances among labor unions, the party, and his newspapers. By 1904, Socialists began to win elections to the Common Council, County Board, and state legislature. Milwaukee’s Socialist Party swept the 1910 elections, winning control of city government and sending Berger to the U.S. House of Representatives. As the first member of his party in Congress, Berger won national attention for his old-age pension bill and his work on labor issues. Berger lost his seat in 1912 and returned to being a full-time editor and party leader. Because of Berger’s opposition to World War I, the Leader lost its mailing permit in 1917 and Berger was indicted under the Espionage Act in 1918. Berger and four other Socialist Party leaders were convicted in Chicago, and then in early 1919, Judge Kenesaw Mountain Landis sentenced them to twenty years in prison. Despite (or perhaps because of) these attacks, Berger’s electoral endeavors improved during and after the war. He came within thirteen percentage points of winning a special election to the U.S. Senate in April 1918 and later that year won election to Congress. Free on bail during his appeal, Berger went to Washington to take office but was denied his seat in November 1919. Berger won reelection in a special election the following month with 55% of the vote, but Congress again refused to seat him. The U.S. Supreme Court overturned Berger’s conviction in 1921. With his name cleared, Berger won election to Congress in 1922, 1924, and 1926. During his final three terms in Congress, Berger emphasized civil liberties, anti-lynching legislation, and repeal of Prohibition. He lost his final election in 1928 and died the following year in a streetcar accident. In his private life, Berger married Meta Schlichting, a Milwaukee schoolteacher, in 1897. Meta Berger was active in politics in her own right, serving on the Milwaukee School Board (1909-39), the University of Wisconsin Board of Regents (1928-34), and in suffrage and peace organizations. ^ This entry draws largely on Michael E. Stevens, ed., The Family Letters of Victor and Meta Berger, 1894-1929 (Madison: State Historical Society of Wisconsin Press, 1995); Edward J. Muzik, “Victor L. Berger, A Biography” (Ph.D. diss., Northwestern University, 1960); and Sally M. Miller, Victor Berger and the Promise of Constructive Socialism (Westport, CT: Greenwood Press, 1973). Miller, Sally M. Victor Berger and the Promise of Constructive Socialism. Westport, CT: Greenwood Press, 1973. Muzik, Edward J. “Victor L. Berger, A Biography” Ph.D. diss., Northwestern University, 1960. Stevens, Michael E. ed., The Family Letters of Victor and Meta Berger, 1894-1929. Madison: State Historical Society of Wisconsin Press, 1995.